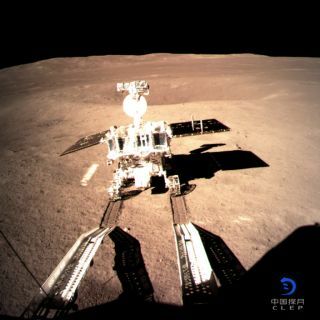 China's Yutu 2 rover rolls onto the moon’s far side shortly after its Jan. 2, 2019, touchdown. China's historic robotic mission to the moon's far side could just be a preview of some unprecedented human exploration of Earth's nearest neighbor a few years down the road. Chinese officials have voiced a desire to send astronauts to the moon. And the nation's leadership places a premium on doing space-related things that have never been done before — such as landing on the mysterious lunar far side, which the Chang'e 4 mission pulled off Wednesday (Jan. 2), and building the world's largest radio telescope. Chang'e 4 deployed a rover called Yutu 2 on the moon's far side, too. "I think what we will see will be either more people, a more extended stay, or maybe landing at a pole — something that'll make people say, 'Wow! That's not just replicating what other people have done,'" Dean Cheng, a senior research fellow at The Heritage Foundation who's an expert on China's space program, told Space.com. "I could imagine a manned landing on the far side of the moon, though that's really risky," Cheng said. Another very real possibility, he added: Sending a woman to the lunar surface. All 12 of the Apollo astronauts who walked on the moon between 1969 and 1972 were men. And none of them stayed on the lunar surface for more than 75 hours. The first Chinese satellite didn't reach orbit until 1970, 13 years after the Soviet Union kicked off the space age with the launch of Sputnik 1. But China has steadily improved its off-Earth expertise over the decades and is now a major space power. For example, in 2003, China became just the third nation to launch astronauts into orbit, after the Soviet Union and the United States. Since then, China has launched — and sent people to — two separate Tiangong "space labs," to help lay the groundwork for a full-on orbital outpost that China aims to have up and running by 2022 or so. And then there's the uncrewed side of things. To provide a little more perspective on China's rise: In 2018, the nation conducted 39 orbital launches, more than any other country. The United States was second, with 31. So there's little reason to doubt China's ability to pull off a crewed moon mission. Indeed, China could well do it before NASA (which has said it aims to return astronauts to the lunar surface by the late 2020s), according to Joan Johnson-Freese, a professor of national security affairs at the Naval War College in Newport, R.I.
American space technology and innovation are superior, Johnson-Freese told Space.com, but China has one key advantage: political will. Such volatility does not plague the space program of authoritarian China, which has been ruled by the Communist Party since 1949. "We are capable, but the Chinese are persistent, and it's going to pay off for them," Johnson-Freese said. Chinese space officials have discussed building a crewed "lunar palace," perhaps near the moon's south pole, and eventually sending astronauts all the way to Mars. The country has already performed a one-year mock moon mission called Lunar Palace 1 as part of its work. However, such goals remain unofficial at the moment. "The Chinese still work according to five-year plans," Cheng said. "And we've seen no indication that the next five-year plan — 2021 to 2025 — has a manned [lunar] mission involved." Chinese boots therefore probably won't hit the gray lunar dirt until the 2026 to 2030 timeframe at the earliest, said Cheng, who added that he views 2031 to 2035 as more realistic. And China is in no great rush. The country isn't racing to beat the United States or anyone else, Cheng stressed, but rather is embarked on a long-term program of sustainable development. Chinese space officials "have said they are building a program built on infrastructure, rather than 'been there, done that, let's go home,'" Johnson-Freese said. And in case you were wondering: Significant collaboration between the United States and China on a crewed lunar mission, or any other major space endeavor, is unlikely without new legislation. Since 2011, NASA and the White House Office of Science and Technology Policy have been barred from cooperating with their Chinese counterparts on space-related activities, unless advance congressional approval has been secured. This prohibition is known as the Wolf Amendment after its champion, former Rep. Frank Wolf (R-Virginia).